From the late 1930s, Leo Fender had a radio repair shop in Fullerton that also sold records and musical instruments, so it was a natural progression to start building his own guitar amps. Fender initially teamed up with Clayton ‘Doc’ Kauffman, a lap steel enthusiast and inventor who had previously worked for Rickenbacker. The duo patented a guitar pickup design in 1944 and began producing lap steel guitars and amps under the K&F brand in 1945. Kauffman left the brand to pursue other interests in 1946, leaving Leo Fender as sole owner of K&F. It was in this year that Fender Electric Instruments was established and the very first ‘Woodie’ amps were made, including the legendary Model 26, which would become the Deluxe. Just a couple of years later, Fender started covering its amps in the varnished yellow and black cotton twill material we’ve all come to know as ‘tweed’. The cabinet and circuit designs went through a few changes, starting off with the so called ‘TV’ front and wide panel versions in 1948 and 1953, before settling on the legendary ‘narrow panel’ shape, which was introduced in 1955. In the same year, the film Blackboard Jungle was released, featuring the song Rock Around The Clock over the opening credits. This cultural watershed lit the blue touch-paper for a global revolution in pop music that brought the electric guitar to centre stage, and with it, Fender’s tweed amps. The tweed era lasted until roughly 1959, although the Champ hung on for slightly longer, bowing out around 1964. Ever since, the Fender tweed sound has been used on countless gold and platinum albums. The little Champ, with its small loudspeaker and warm, compressed single-ended pure Class A power stage is perfect for recording, with a truncated frequency response from its smaller speaker that needs little or no EQ to sound perfect in a mix. This is the amp reputedly used by Eric Clapton on the milestone Layla And Other Assorted Love Songs album, Billy Gibbons on Tres Hombres, Joe Walsh for the slide part on Rocky Mountain Way, and Jeff Beck on Blow By Blow, to name just a few massively influential recordings. The bigger, punchier Deluxe, with its cathode-biased push-pull output stage and 12-inch loudspeaker was perfect for small clubs but still small enough to get a great cranked tone in the studio. This was the amp of choice for most of Neil Young’s early recordings, as well as the solo vehicle for Larry Carlton’s epic performances on Steely Dan’s Royal Scam, including Kid Charlemagne and Don’t Take Me Alive. The 5E3 tweed Deluxe had two channels for microphone and instrument, which sound different and also interact with each other, because of the way Fender ran the signal path, a characteristic that the tweed Deluxe is famous - or infamous - for. It’s therefore possible to get a surprisingly wide range of tone colours by juggling the two volumes and single tone control against each other, and it’s also possible to jumper the inputs for a fatter tone. The influence of these small tweed amps has never diminished, and there’s never been any let-up in demand for early tweed Champs and Deluxes. Hardly surprising, then, that the relatively simple circuits and lack of supply versus demand prompted some forward-looking amp builders to start making their own. THD produced its version of the 5F6 Bassman back in 1987, right at the start of what would become known as the ‘boutique’ revolution. Many others followed, both large and small. Peavey’s long-running Classic Series was revived in tweed in the early 1990s, while Rivera’s 1980s R-Series (now evolved into the Quiana or Fandango) features a very Fender-influenced channel that can sound like tweed or later ‘blackface’ designs, with a unique footswitchable boost circuit that emulates the sound of a small cranked-up amp such as the Champ. Prominent boutique tweed tone specialists today include Victoria, Clark, Headstrong and Swart, who all produce excellent replicas, as well as modern designs that incorporate some features of the original circuits. Probably one of the best modern tweed alternatives available - at a price - is Tone King’s superb Imperial, now in Mk II guise, which effortlessly conjures up the filthiest of tweed overdrives while maintaining a superlative clean channel. Six decades on from the debut of these simple, almost prehistoric valve circuits, the world of music production has changed dramatically. 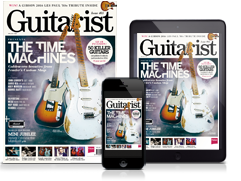 Digital technology is so common and so familiar that many guitarists think nothing of plugging their guitar into a computer and dialling up their favourite tweed amp in software. However, these modern facsimiles miss the point. It was the imperfections, quirks or characteristics of Fender’s early amps that made them so special. Just as the emotive impact of a real (and imperfect) human musical performance cannot be duplicated by a computer program, so Fender’s tweed amps remain unique, imperfect and capable of inspiring some of the greatest guitar music ever played.